e-Book, PDF format, watermarked, 170 colour ills. 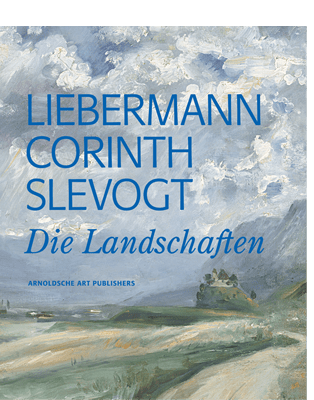 Max Liebermann, Lovis Corinth und Max Slevogt, three early 20th-century artists who did not view themselves primarily as landscape painters. On the contrary, they saw themselves as figurative painters who only engaged sporadically in landscape painting. They did so without being commissioned and free of constraints of all kinds, hence with particular dedication. Painted on trips or where they were staying on holiday, their landscapes were not practised to the point of becoming rigidly routine tasks. Consequently, their landscapes represent a high point of their respective painterly œuvres. Liebermann’s paintings of his garden on Wannsee, Corinth’s Walchensee landscapes and Slevogt’s Palatinate landscapes painted at Godramstein and Neukastel are world-famous. However, exotic or less well known works such as the paintings Slevogt did in Egypt and Corinth’s early landscapes from his Munich days are included in this publication. The catalogue provides a concentrated focus on the landscape paintings of the three great German Impressionists. Accompanying essays elucidate their switch to landscape painting, addressing both their inspiring relationship with French Impressionism and their interest in the Barbizon School as well as the modern Dutch landscape tradition. In addition, an overview of German Impressionism and the development of German landscape painting in the 19th century introduce the subject matter in depth.